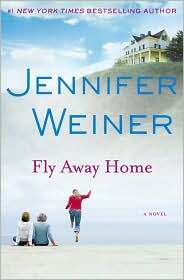 Fly Away Home by Jennifer Weiner tells a story that seems all too familiar right now: a politician is caught cheating on his loyal wife of three decades. Sylvie, the wronged and distraught wife, isn’t sure what to do with herself, since her life has been solely about helping her husband with his political career for their entire marriage. This book tells the story of how she, along with her daughters Diana and Lizzie, cope with the senator’s indescretions. Sylvie finds solace, and unexpected company, when she decides to cope at her family’s old summer house in Connecticut. The story gets complicated, since Sylvie’s daughters are going through troubles of their own when the scandal breaks: Lizzie has just gotten through with another stint in rehab, and Diana is stuck in a loveless marriage and has responded by carrying on her own extramarital affair. What I love about Jennifer Weiner’s books is that the characters are real and relatable. They are flawed, and they remind you of people you know. 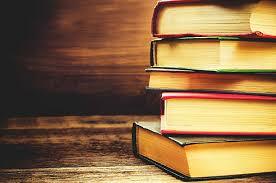 This is the case with this book. It feels like a scandal ripped from the headlines, but with enough personality and emotion that you feel like you know Sylvie and want nothing more than to comfort her and tell her to be strong. But my favorite character had to be Lizzie. Though she struggled through a lot, she worked hard to overcome her demons and make a good life for herself and anyone else who surprisingly came along…. If you haven’t read them yet, I highly recommend checking out some of Jennifer Weiner’s other books, including In Her Shoes, which was later adapted into a hit movie starring Toni Collette and Cameron Diaz as sisters Rose and Maggie. 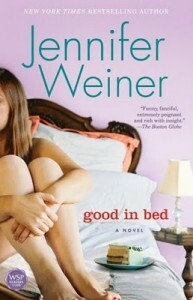 But my personal favorite of Jennifer Weiner’s works (and the favorite of so many other women I know) is Good In Bed. The book is about a plus-sized woman who finds out her boyfriend is writing about her and her size in his column (titled Good In Bed) in a Cosmo-like magazine. The book is both witty and emotional, and I kind of wanted to be Cannie’s best friend by the end. Pick up any one of Jennifer Weiner’s books, and I bet you won’t be disappointed.